Tasty Tortellini. Delicious Ravioli. All handcrafted and delievered fresh to grocers throughout the state. We at DePuma's know how hard it is to find fresh, quality Gluten Free Products, so we want to make sure you can get your hands on them, too. Our gluten free pastas are shipped to your doorstep from our online store, so we encourage you to buy gluten free pasta from the DePuma's online store. 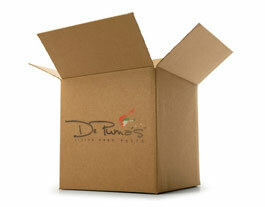 After you place your DePuma's Pasta order, your shipment will arrive at the address you specify to DePuma's. All packages will be shipped according to your location within the United States. DePuma's distribution center is in North Haven, CT, and the shipping method and rate will vary depending on your location. Please note that once the order is placed, there is no way to change your shipping or billing address. Orders are typically shipped within 3 business days of the original order date. Once your order has been shipped it will arrive within 2 business days. Though the customer does not need to be present for the shipment to be delivered, we do recommend it. We ask that when you call, you have detailed instructions of where to leave your package. If possible, we recommend a cool, shady spot that is easily accessible to your delivery person. IMPORTANT: All shipments are shipped with dry-ice. Once you receive your package, you should immediately put it in the freezer, depending on how long you plan to keep your food before cooking it. DePuma's will ship your items on Monday, Tuesday or Wednesday depending on when the order is placed. Typical arrival date is two days after ship date. If requested, tracking numbers for your order can be provided, or you can login to your DePuma's Account and view your order history for your tracking information.